Preparing for a wedding can take many months, even years. Finding the right venue, dress, caterer, floristâ€”it is almost too much to even think about. Then you need to come up with a favor to offer guests of your nuptial ceremony. Often those choices get tossed off until the last minute when some box of chocolate or a wine flute is thrown in simply to get the job done. Luckily we are here to offer you an option that is perfect for fall or winter weddings right now. 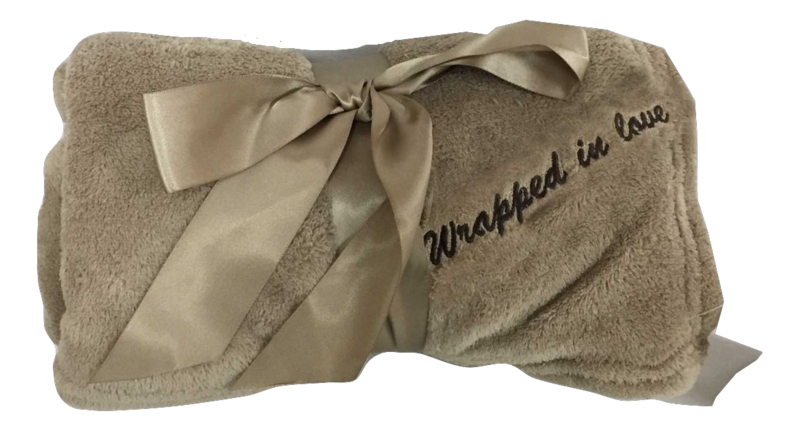 Plush fleece blankets can be adorned with the names of the bride and groom presented in a beautiful and stylish font. These customized blankets can be useful to guests as the party goes into the deeper and cooler hours of the night. As the years go on, these useful blankets might become helpful for guests visiting from out of town or used when on a picnic in the park. No matter what your guests do with them, buying fleece blankets in bulk is a better option for a bride and groom financially than springing for fine crystal on a whim. Check out our styles and see if this is the perfect wedding favor for you. I love the blanket on the picture, it's exactly what I'm looking for. My wedding is June 27, 2015 and I need approximatly 150-175 blankets as favors. I'd love to have them personalized with the phrase, wrapped in love. Let me know if this is possible through this site or if I need to keep looking elsewhere! Looking for about 30 embroidered blankets for 10.10.15. Would like some info on color, size, & price. Thank you! Hello, I am looking to have about 50-100 blankets made with our names and wedding date embroidered on them. Colors would be Chocolate with burgundy writing or vice versa (maybe even half and half) Our wedding is October 24,2015. Can I get an estimate on how much it would be to have the blankets made and hopefully done before 9/24/15? Hi, I am looking for about 75-80 small blankets to give as a wedding favor. Can I get an estimate on how much this would cost? My wedding is 10/24/15. Thanks! I am also interested in about 100 of these blankets. Do you have blue available? How much are they? I'm interested in 140 fleece blankets in gray. Can I get an estimate on price please. I am looking for ivory or grey or burgundy fleece blankets for a wedding favour. I would need approx 275. Are they available and what is the cost? Can someone please contact me regarding the pricing of about 200 blankets? Thank you! Interested in 150 blankets for my wedding on 9/30/17. Pleas contact me regarding pricing. Thank you. Hey there, I'm looking for details on pricing for fleece blankets for an October wedding. Where can I find this info? Hi there, I'm interested in purchasing about 100 blankets for a November wedding next year, where can I find pricing information and purchasing options? Hello! Interested in 150-200 blankets for a wedding in 2019. Would also love pricing & ordering information if possible! Thank you so much! Hello, I need 100 blankets for March 2019 for wedding favors. Please let me know price.